Home Local News Way To Go Girls!! In another marathon match which went five games, the Wolfpack defeated Guardian Angels Central Catholic 23-25, 22-25, 25-21, 25-13 and 15-10. It marked the first time this season the Wolfpack had won a five-game match, having lost their previous two. “I’m so proud of the girls. They’ve worked hard all season,” Coach Tina Thiele-Blecher said about the match. “I felt, in the locker room (prior to the match) that we were ready to go.” She said, after dropping the first two games, they needed to get back to what the team does best. “I just told the girls to go out and play Wolfpack volleyball.” “You could just see the fire in their eyes,” Thiele-Blecher said about the start of the final game. 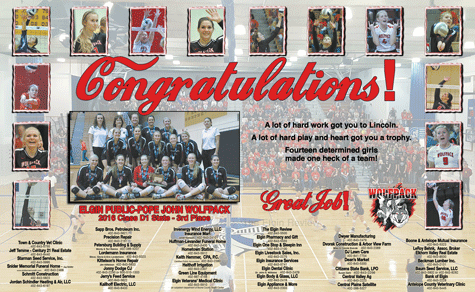 See this complete story plus the other two tournament game stories in this week’s edition of The Elgin Review.